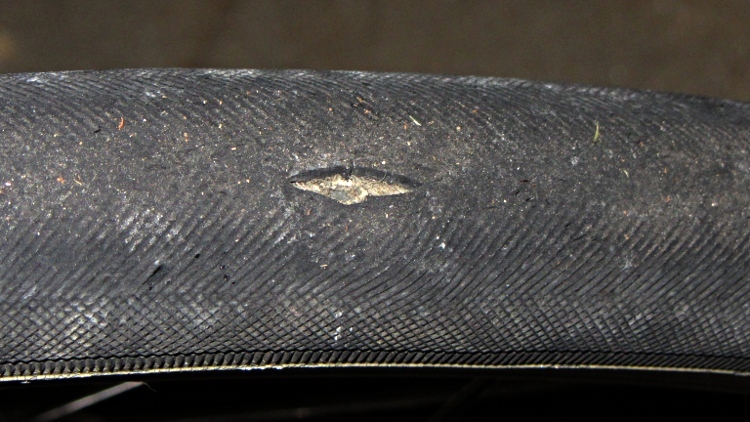 Another Tread Gash: Tire Liners FTW Again! Found this in the front tire of my Shop Assistant’s bike. It’s a Primo Comet Kevlar, not that the Kevlar belts can cope with an assault like that. The smooth surface at the bottom of the gash is the tire liner, of course. She won’t be using the bike for a while, though, so I’ll keep our stock of new tires for our bikes. I’m sure they’ll come in handy this season.